During World War II the American government asked civilians to participate in the war effort. A common way for the government to communicate with civilians was through posters hung in public places. Inspirational, informative, instructive, imploring—the posters were a major part of the war effort. Virginians would have seen many of the posters. 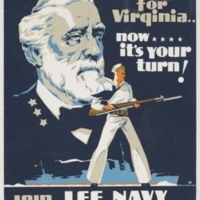 In this poster, the image of Robert E. Lee is used to encourage Virginians to join the Lee Navy Volunteers. The text reads as a challenge from Lee to prove one's love of state. This is a shift from many of the posters, which emphasized nationalism and patriotism to the USA as a whole. 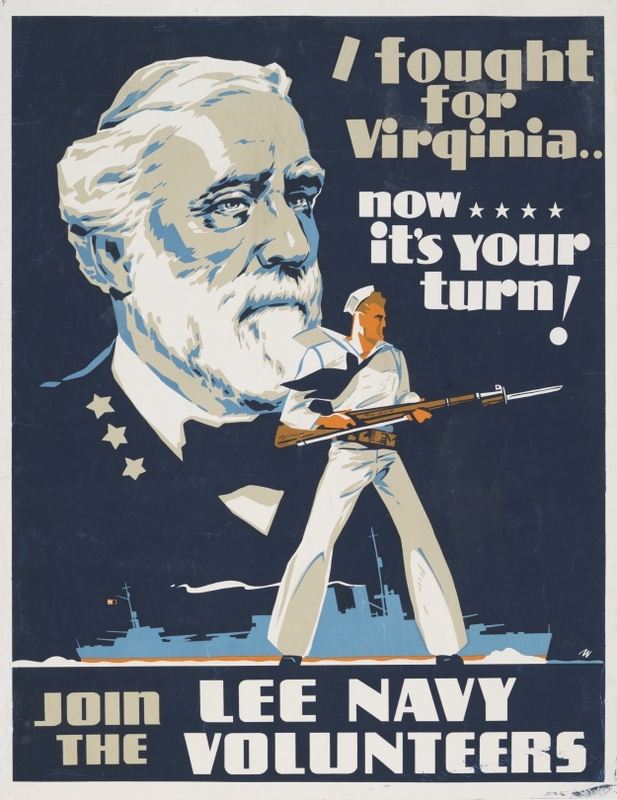 Up for Debate: Do you think it is appropriate to use the image of Lee, or any Confederate, for military recruitment or to instill a patriotic action? Why or why not? Art Exploration: Create a modified version of this poster that depicts a WWII General encouraging youth of today to defend the country by joining the military. “I fought for Virginia - Now it's your turn! 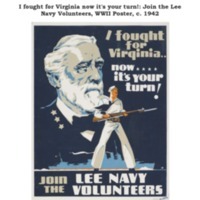 : Join the Lee Navy Volunteers, World War II Poster, c. 1942,” Document Bank of Virginia, accessed April 21, 2019, http://edu.lva.virginia.gov/dbva/items/show/18.